Joining the NETGEAR ProSAFE family of Smart Switches with high performance and cost efficiency, this 10-port Gigabit Smart Switch is packed with powerful features capable of enhancing any type of business network. The GS110TP is designed for customers who need a low port density solution with the combination of Gigabit speed and PoE capability. 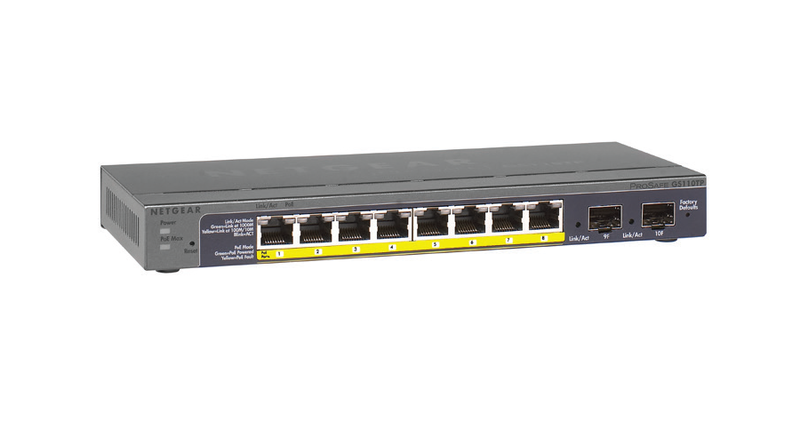 The GS110TP comes with 8 dedicated 10/100/1000 Mbps copper ports to connect to your end devices and two additional Gigabit Fiber ports for uplinks with greater distance. With PoE capability on all 8 copper ports, the GS110TP can automatically detect PoE on the end devices and dynamically manage power assignments and priority. It is capable of delivering up to 15.4W of power to devices such as wireless access points, IP phones and IP cameras, providing flexibility and ease of deployment to your network.